'Europe is facing great challenges with the spread of Islamist terror,' Netanyahu tells Arutz Sheva ahead of trip to Netherlands. ­­The Prime Minister’s airplane took off this morning to the Netherlands, where Prime Minister Binyamin Netanyahu is to meet with his Dutch counterpart and additional officials in the Dutch parliament. 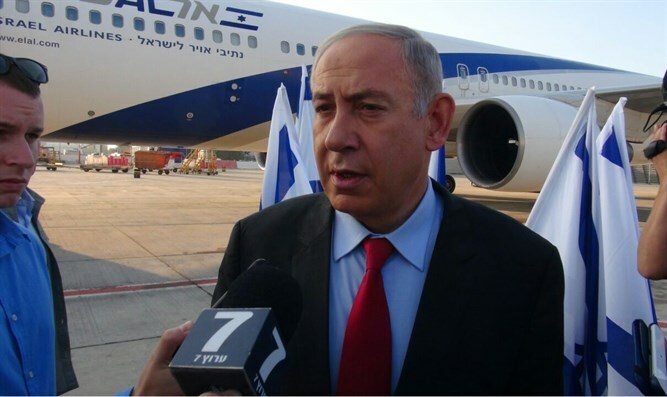 Before boarding his plane, the Prime Minister spoke with Arutz Sheva about the tragic collapse of the parking garage in Tel Aviv and subsequent rescue efforts, and also addressed the purposes of his visit to Holland. Regarding the purposes of his visit to the Netherlands, the Prime Minister said: “I’m going for a political visit in the Netherlands. I am going to visit a friend of Israel – and a personal friend of mine – Prime Minister Mark Rutte, as well as members of the foreign affairs committee of the Dutch parliament, and the King of the Netherlands." “Europe is going through changes; it faces great challenges involving the spread of extremist Islamic terror. I am going to talk about the central role that Israel plays in the Middle East as the most stable factor, the most stabilizing factor, and the source that contributes greatly to the prevention of the spread of extremist Islamic terror. “This is a new realization which is, of course, important for Israel, but is also very important for Europe, and we are working to gradually convey this understanding to all the countries of Europe,” Netanyahu said.